Hairy crabs are extremely popular in China. These were in a market in the eastern province of Jiangsu. Fake products permeate nearly every corner of China's economy. Earlier this year, the trend seemed to reach a new low when phony Apple stores were exposed in southwestern China. Each fall, the fakery even extends to the world of seafood and East China's Yangcheng Lake, which is just a short train ride from Shanghai. Yangcheng is home to what are reputed to be China's tastiest and most expensive hairy crabs. The trick is finding a real one. The market in counterfeit Yangcheng hairy crabs is 10 times the market in real ones, according to the Yangcheng Lake Hairy Crab Association. Local crab wholesalers have fought counterfeiters for years with various tactics. They've used lasers to etch the Yangcheng name on crab shells. This year, the crab association distributed 15 million plastic tags to certify their crabs were the real thing. The tags even have a serial number and a toll-free phone number consumers can call to check. Yet fighting counterfeit crabs — like fighting any fake product here — is a Sisyphean task. "Everything is being counterfeited," says a crab fisherwoman with the surname of Xing, who sells crabs by the side of Yangcheng Lake in the city of Suzhou. "There's nothing you can do about it. And you can't control it." A crab fisherman plies Yangcheng Lake in the city of Suzhou, not far from Shanghai. The lake is reputed to produce the tastiest crabs in China, but most crabs raised in Yangcheng actually come from somewhere else. Xing, who sits beneath an umbrella by the roadside, sells her small crabs for about $4 each. That's a good deal, considering larger crabs can sell for more than $9 in wholesale markets. Shanghai restaurants can charge about triple that. Xing says she could charge more if it weren't for all the counterfeits. "The price for our Yangcheng Lake crabs could have been higher, but the fakes ones keep the price the down," she says. Xing has some of the plastic tags the association distributed this year, but she says they are only so effective. "Every farmer with a local residency permit has a license to raise crabs in Yangcheng Lake," she says. "People who don't, just buy the tags from other farmers, and there are also fake tags." Yangcheng Lake hairy crabs derive their name from the mossy, brown hair that hangs from their claws. 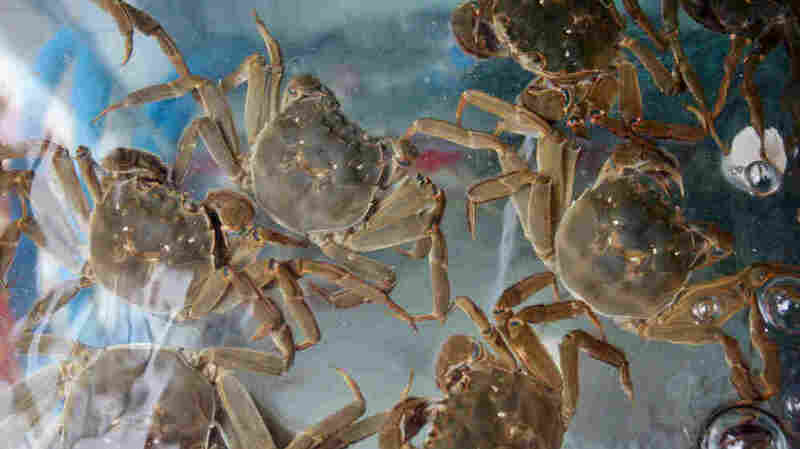 The crabs are famous for their sweetness, which locals attribute to the lake water's quality and habitat. The rise of the counterfeit Yangcheng crab is a classic Chinese business story. Local people enjoyed hairy crabs for years, but demand took off in the 1990s as the government's economic reforms boosted incomes. "After the opening up of the Chinese economy, some Shanghainese became rich," Yang recalled. "On the weekends, they'd drive up here with their families and cash to have fun and savor hairy crabs." Eventually, local crab farmers couldn't meet demand and fakes poured in. Everything is being counterfeited. There's nothing you can do about it. Pushing counterfeits is good money. Using the Yangcheng brand, vendors can mark up a crab's price by at least 30 percent. And, by just looking at a hairy crab, consumers can't tell whether it came from Yangcheng Lake or elsewhere. In Shanghai's Tongchuan Seafood market, Yangcheng hairy crabs are sold from giant fish tanks, but even the vendors admit many are counterfeit or only recently acquainted with Yangcheng Lake. A vendor who only gave his surname of Li because of the sensitivity surrounding hairy crabs described a typical scam. "We rent a patch of water in Yangcheng Lake and put crabs from Nanjing, Jiangsu and Gucheng lakes for about three months," he said, matter-of-factly. "People think these are Yangcheng Lake hairy crabs, but we know they aren't." Vendors even have a nickname for crabs transplanted from elsewhere to the waters of Yangcheng Lake. In Chinese, they're called "xizao xie," or "shower crabs." Li says this practice is not a secret among vendors. "Only to consumers," he says. Authenticity is an elastic concept in China, even for the Yangcheng Lake Hairy Crab Association. Yang, the association's leader, says whether a crab is a really a Yangcheng crab all depends on how long it's actually lived in the lake. "As long as they spend the last six months before harvest in Yangcheng Lake, they will be considered what we call Yangcheng Lake Hairy Crabs," he says. "There are very few crabs actually born in the lake." So, most of the crabs harvested from Yangcheng Lake — the ones with the plastic tags touting their authenticity — are actually from somewhere else. Yang says it's no big deal. In fact, he says crabs don't grow naturally in Yangcheng Lake anymore anyway, because human development has disrupted their spawning patterns. "The waterways leading to the Yangtze River are blocked by dams, so the adult crabs can't go to the ocean to mate and young crabs can't return," he says. "What can we do? 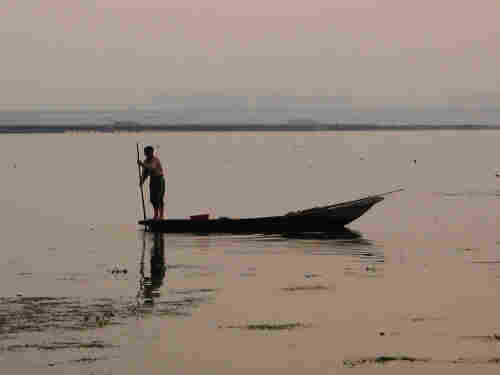 We can only solve the problem by importing young crabs into the lake." The hairy crab season opened late last month and some Chinese still swear by them. But others who grew up eating the delicacy stopped years ago. The reason, they say: too many fakes.